Beast proves that love is not for the faint of heart in the MV for their new single, “Shadow,” an elegy for a dead relationship. Grim and grotesque imagery provides the backdrop as Yang Yoseob and crew shoot tortured expressions at the camera while singing mournfully about love lost. 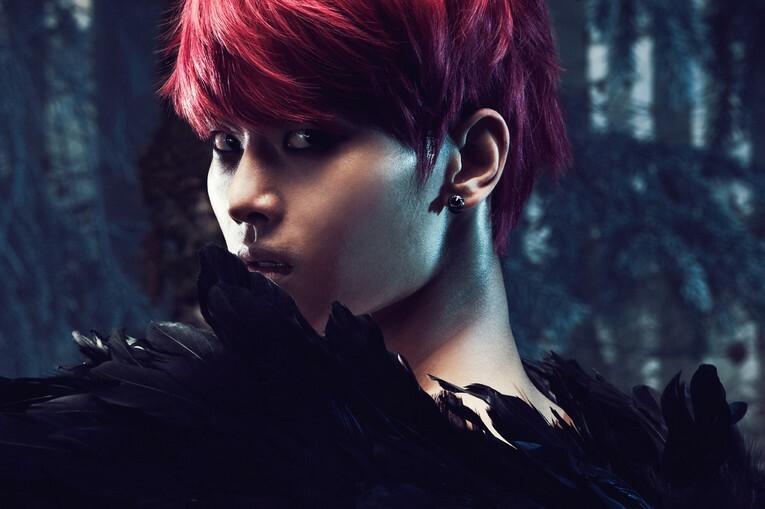 “Shadow” comes on the heels of the MV for VIXX’s “Hyde,” another vignette of love gone wrong with a macabre slant. As genres that appeal to vastly different sensibilities, it would seem that horror and romance make for strange bedfellows. But their unholy union lies at the crux of gothicism, which combines the tropes of fantasy, look and feel, and the strong emotive power of the two. Gothic motifs are an ever-growing presence in K-pop, especially this summer, helping Beast and others take fans on dark, symbolic journeys through the pitfalls of love. “Shadow” and “Hyde” represent a growing body of K-pop MVs that use gothic themes to allegorize relationship woes. Emotionally-charged tropes and hyperbole serve as the engine for gothic allegory. Symbols, the actions of archetypal characters, events, and rhetorical devices commonly found in gothicism carry meaning easily recognizable to most because of the ubiquity of gothicism across art forms and cultures. The fantasy component allows for exaggeration, making the underlying (and overlying) meaning of figurative devices and the plot even more clear. Some elements of gothicism include macabre imagery, the grotesque, melodrama (often used for parodic effect), an air of suspense or mystery, the supernatural and uncanny, haunting beauty, imperiled women, romance, stories set in castles or old manses with medieval (or pseudo-medieval) architecture, and darkness (and lightness, in some cases) among others. As mentioned before, the MV for Beast’s “Shadow” serves as a good example of gothic allegory in K-pop. The video is a symbolic meditation on relentless depression after a relationship ends. Macabre imagery and ghostly figures represent soul death, someone being a shadow of his former self. Many of the hallmarks of gothicism, including morbidity, grotesque imagery, the supernatural (ghosts, doubles, etc. ), darkness/washed out color symbolizing lifelessness, dungeons and gothic architecture are present. The MV, although incorporating images not mentioned in the song, goes well with its dirge-like quality. Lee Jung-hyun’s latest outing, “V,” offers an example of black humor in a Gothic motif. This MV is a playful exaggeration of the clingy girlfriend stereotype, pointing out its silliness and (hopefully) challenging the notions that women are both desperate for marriage and cunning manipulators who trap men into romantic situations. Grotesque aegyo and girlishness—the juxtaposition of repulsive images and immature docility, a major aesthetic element in K-pop—indicate the tantalizing possibility of this MV being edgier and more subversive than it first appears. Gothicism is infusing K-pop MVs with a grotesque beauty that’s as fresh as it is mortifying. Perhaps due to the growing influence of K-rock and the goth subculture on South Korean music, art, and fashion, perhaps attributable to youngsters’ appreciation for a mix of the ghoulish and the glamorous as the urban fantasy and romantic horror genres in books and film gain more cultural currency, or maybe just because they look cool, gothic motifs offer K-pop artists and fans a different way to explore the traditional pop music subject matter of love and loss.